The composting plants consist of some or all of the following technical units: bag openers, magnetic and/or ballistic separators, sieves, shredders, mixing and homogenization equipment, turning equipment, aeration systems, bio-filters, scrubbers, control systems etc. One of the most important equipment is the machinery used to turn the windrows. Either a standard front-end loader or a specialized compost turner may be employed for this purpose. Other types of machinery used in composting facilities include shredding equipment, conveyance devices for moving product around, screening equipment, and baggers. Compostable plastic bags are essential when diverting organic wastes. Shredding equipment speeds up decomposition by reducing particle size at the beginning of the composting process and also contributes to the quality of the finished product by making the compost more uniform in composition. Screening equipment breaks down large, bulky clumps and removes undesirable items such as non-organic materials from the finished product, thereby improving product quality. The desirability of bagging equipment depends on the markets (end-users) for the finished product. A high-quality product suitable for home gardens will be more likely to be distributed or sold in small quantities, and equipment for bagging the product may be necessary. 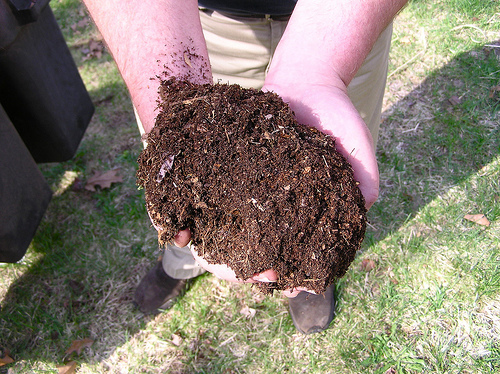 Composting costs include site acquisition and development, regulatory compliance, facility operations, and marketing of the finished product. Additional requirements may include land for buffers around the compost facility, site preparation, and handling equipment such as shredders, screens, conveyors, and turners. Facilities and practice to control odors, leachate, and runoff are a critical part of any compost operation. The cost of constructing and operating a windrow composting facility will vary from one location to another. The operating costs depend on the volume of material processed. The use of additional feed materials, such as paper and mixed municipal solid waste, will require additional capital investment and materials processing labor. The capital costs of windrow or aerated piles are lower than in-vessel composting configuration. However, costs increase markedly when cover is required to control odors. In general, costs of windrow systems are the lowest compared to the other two techniques. The in-vessel system is more costly than other methods, mainly with respect to capital expenditures. In addition, it is more mechanized and more equipment maintenance is necessary; however, it tends to be less labor-intensive.